This was just what I was looking for. They allow in the light, but aren't see through. My boyfriend was able to install seven of them in less than an hour. I closely read all of the reviews before pulling the trigger on these. I originally wanted cotton fabric shades but they were either too pricey or the design was annoying. These are a polyester fabric but the slight sheen of the polyester is only noticeable upon close inspection. They are nicely LIGHT-FILTERING which is exactly what I was looking for since they're for my sunroom. I pull them down once the sun is directly on the windows and the room is still full of natural light. The design of the shades is the best part about them though. They work like cellular shades and stay where you raise or lower them. Very handy function! Overall, I'm quite happy with my purchase. I’m very happy with the look of these shades. I ordered the cordless, cloud white, light filtering option. I’m sure there are nicer options out there but you will definitely pay the price for nicer quality. One negative about the “cordless” is if you have tall windows (like I do), you will have to use a step ladder to lift up the bottom manually to your desired height (when shade if fully raised). These shades let in a fair amount of light during the day & simply help blur full visibility at night (which is what I wanted since it’s a window against my backyard). The material has a slight sheen which I could have lived without. I took off 1 star because one of my shade sticks when trying to raise fully. I will be making a call to Overstock for a replacement. For the price, I think it is a great buy. Only time will tell if they last as I’ve had mine for less than a week and just installed today. Easy to install (except for some difficulties with our crazy non-standard 1910 windows). The cordless mechanism keeps it looking clean, and works well so far for lifting and lowering. This product is definitely a good option for someone looking to save money on what otherwise can be a huge expenditure. Fair warning, the mounting materials and the fabric are a bit flimsy/cheap (e.g., we had one broken bracket from the get go but luckily found a substitute)...but the overall look, once installed, is polished. 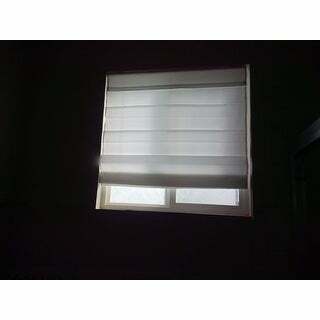 The blinds let a lot of light in, but give us enough privacy at night. We're very happy with it. This shade is perfect for what I needed. The material is light and thin. 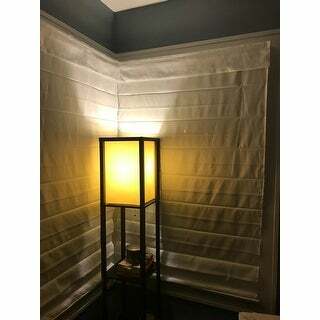 Perfect for giving me privacy when down, yet keeps the room filled with light if down during the day. It is not sheer or see through, just thin enough to allow a lot of light in, yet thick enough to not let you see out or anyone in. I LOVE how the top is very low profile. When the shade is up it hangs just a few inches down and allows to see out almost to the top of the window. I bought another one first that hung so low I felt as if the whole top half was covered all day long. I returned that one and bought this one, over and over again for multiple windows in my house. 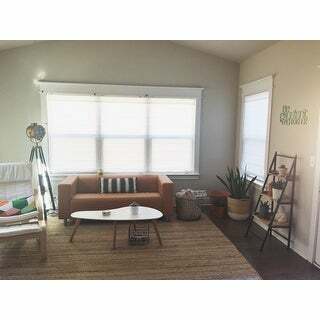 I would highly recommend them to anyone looking for light, privacy, and a modern look. I needed something for an east-facing bathroom window with opaque window film on but still got too much sun in the morning. This is a rather sheer shade; even when doubled up with the window film (as seen in photo, taken at 9:30 am), there is still a fair amount of light coming through. Pros: Very easy to install, I put it up alone in less than 20 minutes from opening the package to finish. Sheer (if you want light through), simple, clean design. And the price is right. Cons: You get what you paid for, not the most sturdy product (but works just fine for what I need). I also think they shipped me a "returned" as there are scratches on the headrail and the box of hardware looks used. However, since the scratches are on the back side and I am in a hurry to get some more shade, I put it up anyway. But if you were to order this, do check everything before throwing away the packing material, etc. Overall a decent product for the price. These shades are perfect! We just moved into a new house and needed shades for a bunch of rooms. We wanted cordless but didn't want to spend a fortune. These shades appeared to fit the bill so we ordered enough for 3 rooms. They arrived super fast and were extremely easy to install by myself. I did the inside mount and they fit perfectly ( window measures 34.25" and we purchased the 34" shade). My only complaint is the warning sticker applied to the back of the shade is very hard to get off and sticks to the fabric. These are absolutely the best cordless roman shades I've ever purchased. We ordered 2 as a test about 3 months ago and hubby easily installed in our master bedroom in our new home. He did use alternate hardware because we have a block home and we mounted inside the window frame due to the style of windows/window frame we have. Easy fix for him. Recently, service techs checking the window frame even commented on how fabulously easy to open and close they are. Easy up and down, no cords (we have cats--so that's perfect! ), filtered light. Ordering more for the rest of our bedrooms and mudroom today! Highly recommend! I bought these for my art studio and they are perfect! All my walls are white and these white shades completed the look. They filter in light when closed but are surprisingly not that see through from outside looking in. I love that you can push them up so high when you want them open so they don’t block much of the window. If I order again I may buy the ones made with thicker white fabric, but I’m happy with these for this room. I love that they are cordless, I’ve had them for 3 months and so far they are still working great! This is a great Roman shade! I love that it's cordless. I have it on the window above my sink in the kitchen, and it's just perfect. I don't love the fabric, but for the price and my purposes, it's just what I needed. They came pretty wrinkly, but that’s expected with the material and shipping..so I’m steaming them to make them look more tidy.... Within 5 minutes of the steaming a plastic piece of the shade popped off given the stitching. PAY the extra $10-$25 for a better quality shade! It looks cheaply made. I was looking for something with a softer look vs my plantation blinds. I had researched quite a bit and found these. 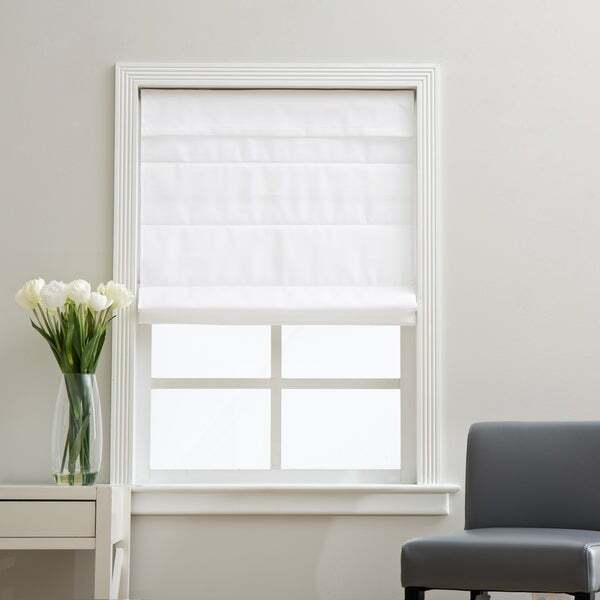 They are the perfect for layering the look of the room - I didn’t purchase the room darkening option, but the window glows — not glares the sun, but filters and glows. Cordless is the way to go! Beautifully made roman shade. Easy to install and really good quality. love these! they are easy to put up and use. I live in a ground floor condo and like how they filter the light and give me privacy without darkening the room too much. at night I have room darkening drapes that blackout any light or view. This is a nicely made shade. The lift mechanism is wonderful...no cords to get in the way. I actually bought these to use as the base and I am covering the front with my own fabric over it. It's a bit of a sewing job, but turning out beautifully. Definitely worth the price. the shades will work ok, I just wish they were a little heavier. I absolutely love these shades. They look lovely in hung in the window. They were fairly easy to install. I also love the ease at which you can push the shade up, even with one finger. These are a nice bright white shade. They do not block out any light. They are not exceptional quality and appear on the less expensive end. I do not mind them for the bedroom and the light that they met through helps wake me up. Good shades. I wish the fabric was a bit more substantial, but good for the price. Installation was easy enough. They raise and lower smoothly. Very good product. It works well and is easy to pull up and down. Lovely as light filters through. Nice fabric. I purchased more. "I need the 46.5 inch wide in the 72 inch long but it's not listed as an option. The other widths do come in that length?" The sizes currently available in the 72-inch length are 32.5 inches, 34 inches and 34.5 inches. "Some answers say these can be outside mounted but others say recommended for inside mount. Which is it?" I'm not at home where I can check, but I think you can use them either way. With an outside mount, you'd have a small gap between the shade and the wall surrounding the window. These shades can be mounted as an inside or outside mount. "Can these be outside mounted?" Yes these shade can be inside, outside, top, or back mounted. "What does the shade measure lengthwise when it's pulled all the way up? Thanks!" 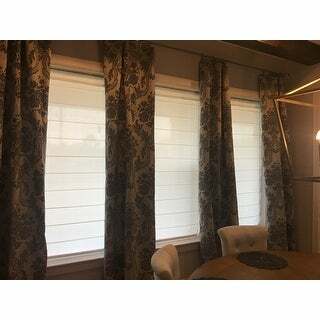 "The fabric on the shades I am replacing measure 34 inches across. When choosing a shade should I be measuring the headrail width across or the shade measurement across (width across)? Thank you in advance!" 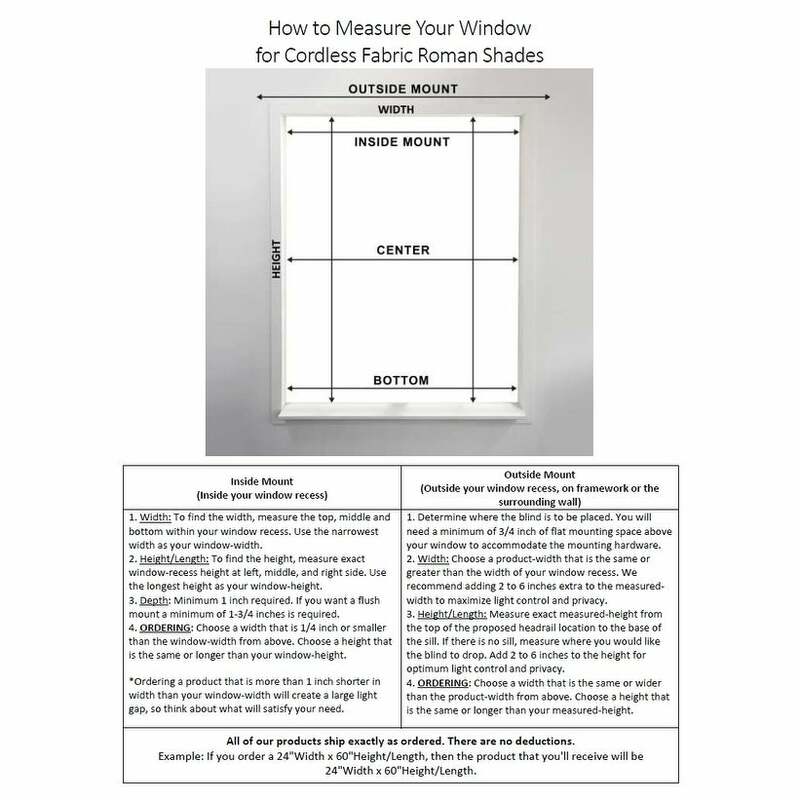 It is recommended that you take the measurement of the inside of your window. Then deduct 1/4 inch from that measurement. You can measure your head rail and compare. "Can these be trimmed to width? I need 45", 41", and 28" widths, so thinking I could start with 46.5" and 29.5" factory widths. I do finish carpentry and some sewing, so I wouldn't be put off if it's a little technical. Also: how much extra length is TOO much? Eg, I want 25" length but can only choose 40" at minimum. Thanks - Dave"
"Can these be shortened to 40” in length?" I think it would be very difficult to shorten.....the cords run through the top and down to the "lift" bar at the bottom. However, you only need to pull down to your desired length. 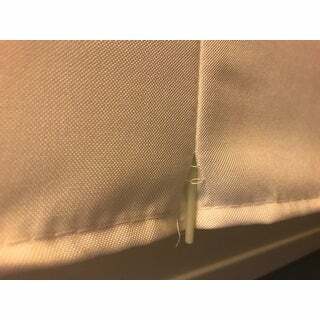 The fabric is thin and doesn't look too bulky even if the shade is not fully extended.